We took a city highlights tour with our travel agency’s private tour, which was a bus with only nine of us. 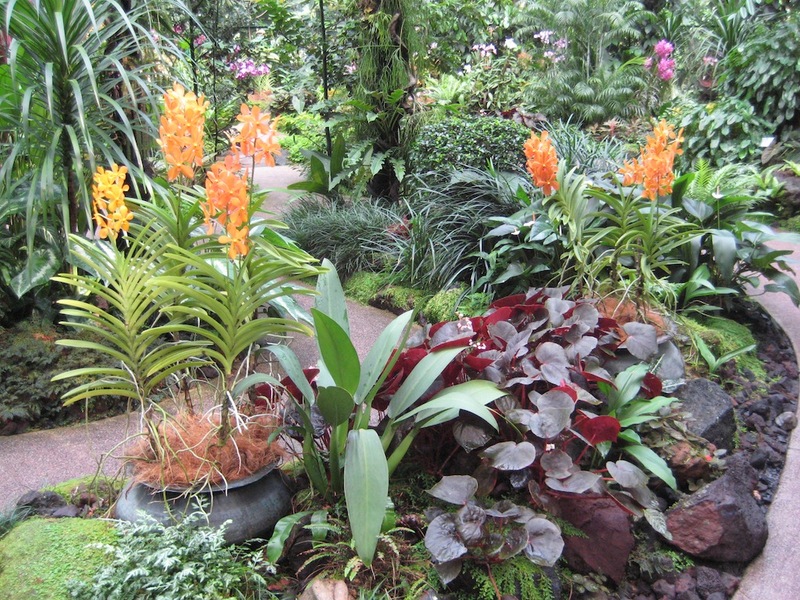 Our first stop was the National Orchid Garden where they have over 60,000 orchid plants on display. The garden is immaculately maintained by over 100 gardeners, who tend to every inch of the garden. This is the largest orchid display in the world. 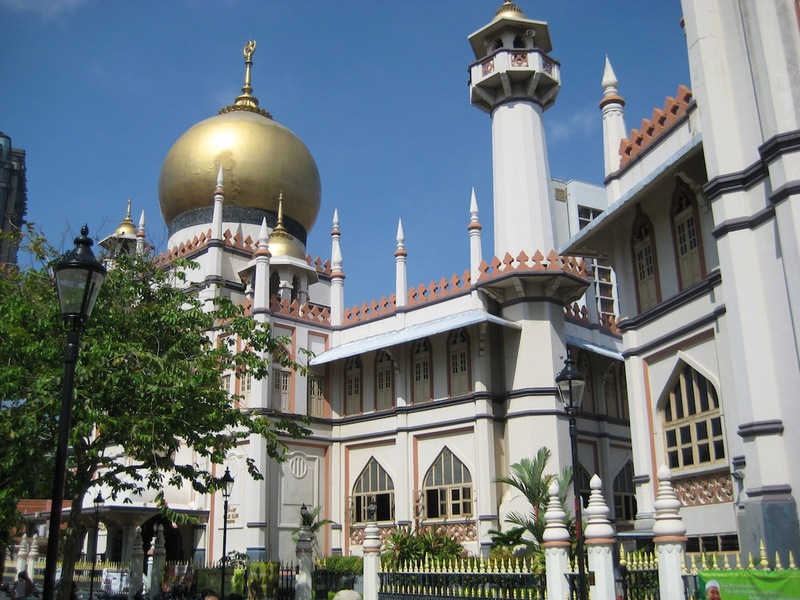 Our next stop was Arab Street to see the gold-domed Sultan Mosque. The area is filled with fabric shops with any imaginable fabric you can think of for sale. Middle Eastern restaurants line the streets, along with a variety of gift shops selling local Asian wares. Most of the buildings in this area are from the colonial period when shop owners had businesses on the ground level and lived on the second floor (shop houses). Today they do not allow people to live on the upper floor due to the risk of fire spreading from one unit to the adjoining units. We then drove by the Raffles Hotel, St. Andrew’s Cathedral and City Hall on our way to the waterfront where we visited the Merlion. The Merlion is half fish and half lion and is the symbol of Singapore. From here you can also see a recently built hotel and casino complex consisting of three 50-story towers with a giant ship shaped structure connecting them at the top. The top floor features an infinity pool, gardens, restaurants and bars and has wonderful views over the city and bay. Some of our fellow travelers had meals there and some even stayed overnight. Next we visited Chinatown where we saw the exterior of the Sri Mariamman Hindu Temple with its ornate multi-colored exterior of elaborate figurines of gods and goddesses. The narrow streets are filled with eating establishments and all kinds of shopping from clothing to handicrafts. Lastly we drove to the top of Mt. Faber, the highest point in the city, where we had a panoramic view out over the city and bay. Mt. Faber is a lush parkland area with a wonderful park at the top. After lunch onboard the ship, Kent worked on emails at a local hotel, while Mark walked a couple of miles across a covered boardwalk in the heat to the island of Sentosa. Sentosa is a cross between Las Vegas and Disney World. The island is packed with hotels and casinos, parks, rides, restaurants, Universal Studios, a cultural center and more. You can elect to pay one dollar to wander the island or select from a variety of packages to enjoy several or all of the 17 different adventure options. 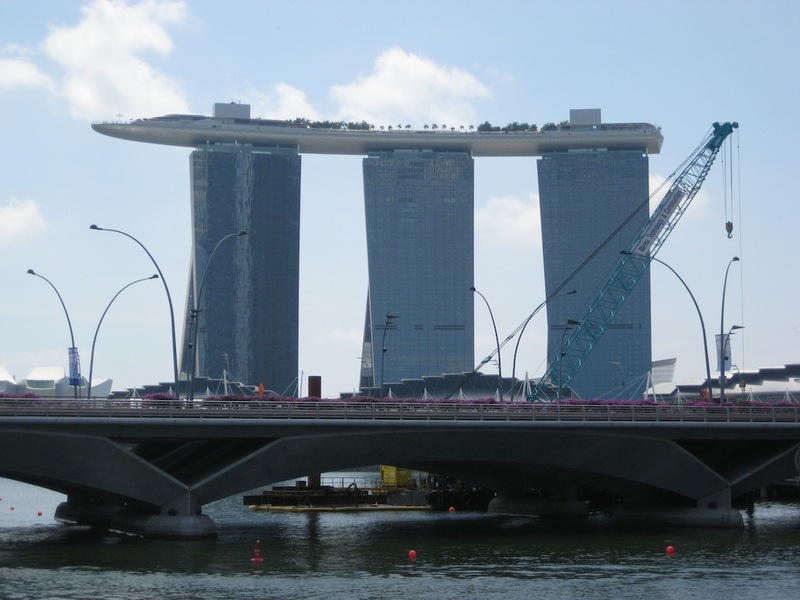 Overall, Singapore appears to be a very prosperous community with clean streets, well-maintained buildings and is very tourist friendly. The public transportation appears efficient and well maintained. Every subway station is connected to a shopping mall of one sort or another. Many of the shopping malls are so large that it is very easy to get lost in them. They have everything from designer shops to handicrafts.